Are there MCLE credits for on-line training? No, on-line training has not been accredited for MCLE credit. There is no need to enroll for the online training. Any individuals such as attorneys, legal staffs, and people without lawyers may take the computer-based training (CBT) online whenever and wherever internet access is available. What are the computer software and hardware requirements for Online Training? If you are using a dial-up/modem connection you may not be able to attend online training. Each training module consist of a large file download which a dial-up/modem connection may not be able to handle. Adobe Flash Plugin. If not installed, you can download a free copy from www.adobe.com. Online Training can not be accomplished if Adobe Flash is not installed. May legal support staff participate in on-line training? Yes, legal support staff or administrative staff in your organization are encouraged to attend online training. However, CM/ECF Logins and Passwords will only be distributed to attorneys. When can I attend Online Training? Online Training is available 24 hours a day, 7 days a week. At the end of each video there will be instructions to click the Finish button, clicking this button will confirm completion of the training module. Failure to click the Finish button will require you to take that training module again. Each completed module will be marked with a check mark. It is a computer-based training application that allows a user to complete the optional training via the internet. I started watching one of the training modules and accidentally closed the window, what do I do? Unfortunately you will need to start that training module again from the beginning. 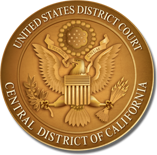 I already E-File in another Federal District Court, do I still need to attend training in the Central District of California? No. However, optional computer-based training modules (CBTs) are available online. I am able to watch the training video on my screen but I don’t hear the audio. Your computer needs to be equipped with speakers in order to hear the content of our training videos. I am trying to view the Training Modules but I am not able to see anything on my screen. As noted on the welcome page of the Online Training Site, your computer needs to be equipped with Adobe Flash. Adobe Flash is a plug-in for your web browser which allows you to view the training modules on our website. Adobe Flash is free and you can download it and install it directly from Adobe’s website (www.adobe.com). Will the system time out if I wait too long to proceed after pausing a training module? Yes, because the Court’s online training website is a secured website, the system will time out any time there is no activity lasting between 30 to 60 minutes. If I start watching a module, do I have to complete it in it’s entirely? Yes, once you have started watching a training module, you will need to finish it in order to acknowledge completion. However, you can always pause in the middle of the module if you need to step away from your computer. When you’re ready to proceed, you can press the play button and the video will resume playing. If you close the video window in the middle of a module you will need to start that module from the beginning. Why can't I access Module 10? That’s because you have not completed modules 1-9. Module 10 will only activate after you have completed modules 1 through 9. This only applies to online training ordered by a Judge. Optional training does not have these restrictions. Do I have to take the training modules in order? No, you can complete the training modules in any order you wish but you must complete all modules shown on the screen before the last module will appear. Do I have to complete all training modules in one sitting (at once)? No, you do not have to complete all training modules consecutively. You can complete one module today, one tomorrow, etc. If a module is put on pause, the session can be resumed from where it is left off. However, the session cannot be resumed if the module is closed before it is completed. When that happens, the session will always start from the very beginning whenever you click on this module to begin the online training. Are there fees assessed for online training? No, there are no fees associated with online training. Approximate time for completion of all modules is about two (2) hours. However, this can vary based on how quickly the trainee responds to the various commands required to advance through the modules.